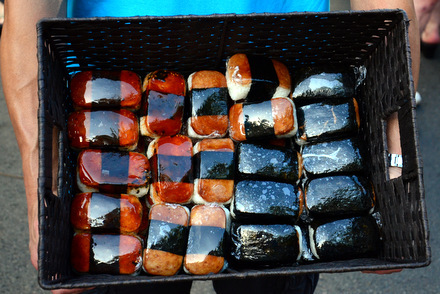 If you have ever visited Hawaii, you know that Spam is hugely popular there and that it used in all types of dishes, from breakfast scrambles to musubi snacks to burgers. With that in mind, it should be no surprise to hear that the biggest Spam festival in the country is held in the state the consumes more Spam than any other. 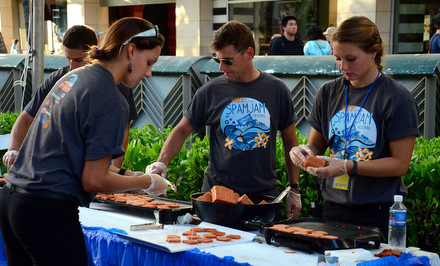 This year I was fortunate enough to attend the 13th annual SpamJam in Waikiki, joining in with thousands of locals in sampling a wide array of creative dishes made with Spam and having a lot of fun. 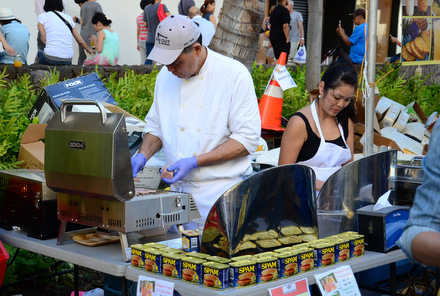 The free festival attracts residents from all over the island, food lovers from the mainland and curious tourists staying at local Waikiki hotels who may have never eaten Spam before. 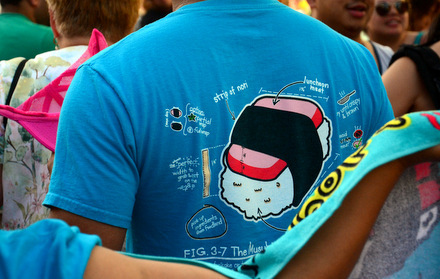 SpamJam takes place on the main street in Waikiki, which is shut down to traffic during the event and lined with stages for musical performers and tents where local restaurants share their creative takes on Spam. 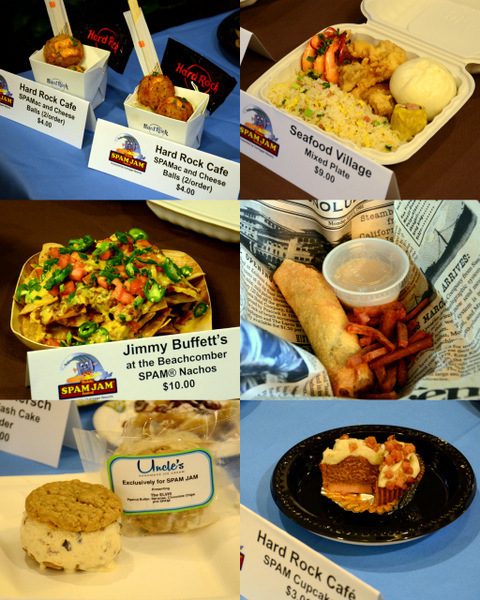 More than 15 restaurants, including both local and international brands, from ABC Stores to the Hard Rock Cafe, participated this year and each came up with an innovative Spam dish to present to the hungry crowd. Now, if you’re not someone who is that familiar with Spam, you will be blown away by how creative these chefs get with Spam. The canned meat was grilled, fried, sliced, diced and even incorporated into desserts. There are more than 13 different varieties of Spam available – and some that you’ll only find in Hawaii, such as the new Portuguese Sausage – and the chefs put them all to good use. I tasted not only Garlic Spam, but Tocino Spam, Hot & Spicy Spam, Teriyaki Spam and the aforementioned Portuguese Sausage Spam. My personal favorite was one of the entries from the Hard Rock Cafe: SPAM Mac & Cheese Balls. Portuguese Sausage Spam was combined with a creamy mac and cheese, shaped into balls and deep fried. They were crisp outside, gooey inside and seemed like they might very well be the ultimate bar snack. 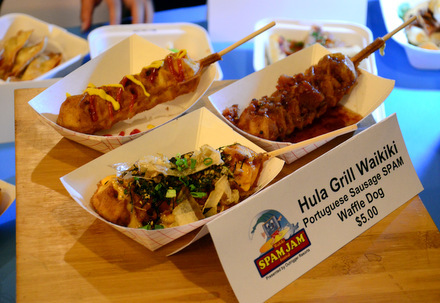 I also thought that the waffled corn dogs, the entry from the SpamJam sponsor Outrigger WaikikiÂ Resort‘s restaurant Hula Grill, was a brilliant use of Spam. If you didn’t know there was Spam inside, you would never suspect that it wasn’t a more traditional sausage! If you were a bold eater, there were several sweet dishes that incorporated Spam, using the meat in much the same way that bacon is often used in desserts to add a savory-salty element. The Elvis ice cream sandwiches made with peanut butter, banana, chocolate chips and Spam seemed to be a particular favorite with the crowd and the Uncle’s Handmade Ice Cream booth had a long line all evening. Once you had your fill of Spam, you could check out the vendors selling Spam merchandise and other local goods, or head over to one of the two stages positioned at either end of the street to relax, watch local performers and work up an appetite for another round of Spam. 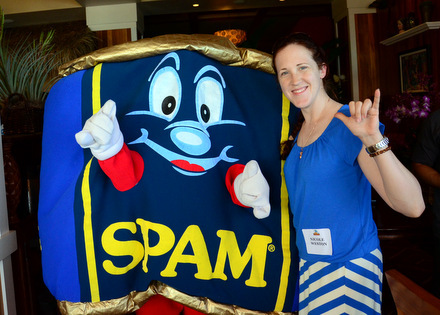 I tracked down Spammy, the mascot for Spam, and grabbed a quick photo opp while I made my rounds through the crowd taking photos of everything. 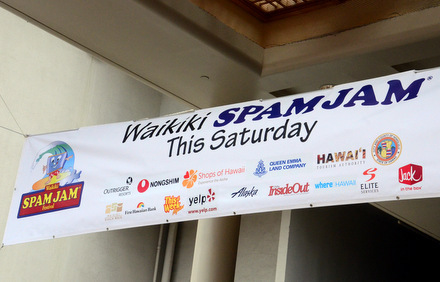 If you’re already a Spam fan or just a curious foodie looking for something fun to do while you’re on Oahu, SpamJam takes place every year around the end of April or the beginning of May (next year’s is scheduled for April 30th, 2016) and it is free to attend. 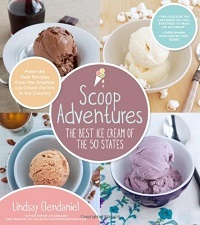 You’ll find plenty of free entertainment, free samples of classic Spam and purchase the Spam-centric treats – which are generously portioned and inexpensive – supplied by participating local restaurants. 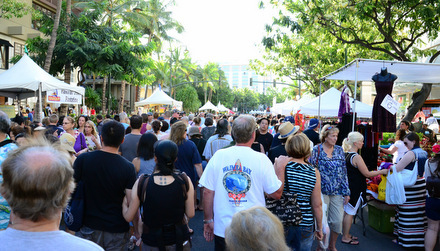 I recommend walking in if you’re not staying in one of the hotels located right in Waikiki, as traffic can be tough getting to the area right before and after the event, but there is plenty to see and it is a great way to spend the afternoon!